not all pictures of the booklet are shown. Tullamore Catholic Parish celebrates in October 2006 the centenary of a church which has been a significant architectural landmark for the town and district. Much more so it is for so many Tullamore people a place of devotion and recollection and of memories of joy and sadness over so many years. As to sadness not least back in October 1983 when the second church on the Chapel Street/Harbour Street site was destroyed in a fire which saw little survive except the spire. This second church was completed in October 1906 and is on the site of a church built about 1802. The third church which incorporates the spire of the old church and most of the stonework at the lower level was completed in August 1986 and as to the interior is contemporary in design. Little is recorded of the pre-1902 church in historical sources unlike that of the 1906 church the progress of which from the foundation stone in 1898 to its completion eight years later was well documented. Although this church was largely destroyed twenty three years ago the memory of it is still green for many people. For some it is perhaps a special event such as a marriage, funeral or a christening. For others it may be âthe Mission sermonâ or the old crib at Christmas time. The old confessionals may hold memories of solace or discomfiture. For the great majority it will be daily or Sunday mass and the many other devotions, from the Confraternity to the Womenâs Sodality, that seemed to absorb a fair share of oneâs waking hours in the Ireland of the pre-1970s and early 1980s. For mass servers of the 1960s it will be serving First Friday mass at 6.30a.m. on a frosty morning or 7.00a.m on Sundays. Church building in the Tullamore district began with the Early Christian foundation at Durrow in the middle of the sixth century. The old Durrow church, now after a long struggle under restoration as a visitors centre, and dating back to the 1700s and earlier was probably built on the site of the first church in the parish. The Durrow High Cross of c. 850 AD is the oldest religious relic in the parish with the exception of the seventh- century Book of Durrow, now in Trinity College, and which was removed from Durrow in the early seventeenth century. The Reformation had taken place in the midâsixteenth century and saw the end of tolerated Catholic worship in the parish church at Durrow and the chapel of ease at Kilbride. Both now passed into the ownership and use of the Established Anglican Church. It was over 200 years before another Catholic church was built in the parish. Its location at Ballyduff meant it was close to Tullamore, a town which was by the late eighteenth century starting to grow and had a population of perhaps 4,000. The Ballyduff church was not so near as would attract unwelcome attention from the authorities at a time when the enforcement of the Penal Laws preventing Catholics enjoying religious freedom had eased. This, the first post-Reformation Catholic church in the Tullamore area was a small T-shaped building some of the walls of which are still standing in the immediate vicinity of the new Axis Business Park. By the 1790s further reliefs had been granted to Catholics so that in 1794, Charles William Bury, Tullamoreâs landlord, was able to offer free of charge (but without the security of a long lease) the present site at Chapel Street and behind the new William Street which had, in 1790, been laid out for house building. At that time neither Harbour Street nor the harbour had been constructed. The site was in the back of the town in a poor area and away from the finer houses in the town centre and the southern side approaching the demesne of Charleville where the townâs landlord resided. By all accounts the new church was a fine building, to which additions were made in 1808 and again before 1850. 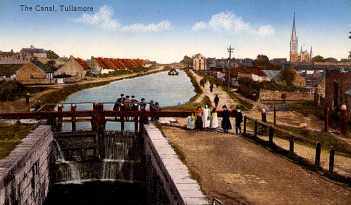 In 1808 the then parish priest, Fr Kearney, petitioned the directors of the Grand Canal Company for a contribution towards the building of an addition to the chapel because 'the enlargement of the chapel has in part become necessary from the great number of people that resort it, in proceeding to your passage boats, more particularly from the province of Connaught, and also the large portion of the labouring poor employed on your works, whose morals, if not attended to, might become so depraved as to endanger the security of your extensive works, which tho' executed with great judgment, are still vulnerable in many parts'. Fr Kearney's entreaties, some might say threats, did not go without notice and he received Â£50 from the canal company for the church building fund. The church must have been in a good state of repair by 1815 because it was now possessed of an organ suitable for a concert as is recorded in the recollections of William Joseph OâNeill Daunt who was born in Tullamore in 1807. O'Neill Daunt, the friend of Daniel OâConnell, records in his memoirs his conversion to Catholicism while growing up in Tullamore in the early 1800s. Father Hugh Behan, the parish priest in the 1890s, had mooted the idea of a new church in 1898 as the old church had fallen into serious disrepair. The original cost of the project was estimated at Â£15,000, although at completion it ran Â£13,000 over budget coming in at Â£28,000. While the foundation stone had been laid in 1898 progress was slow at first. The town was recovering from a long period of depression which had seen the population fall below 5,000 in 1891. Building work began in January 1902 almost three years after the death of Father Behan, who was succeeded by Father Philip Callary â now recalled in the name Callary Street. 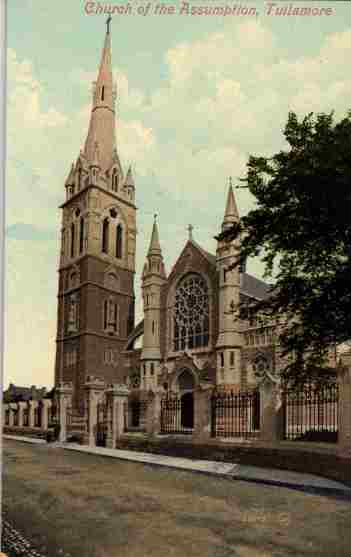 The Church of the Assumption, Tullamore, was opened on Rosary Sunday, 7 October 1906 and in design was the concept of two of Irelandâs distinguished architects, William Hague, and his pupil and late junior partner, Thomas F. McNamara. Hague had designed churches at Trim, Dunshaughlin Termonfeckin and Cathedral House at Mullingar while McNamara had carried out the less successful Kinnegad church and a better earlier work, Castletown Geoghegan church. Hagueâs best known work is the French Gothic style cathedral of St Eunanâs in Letterkenny. One architectural historian, writing after the fire of 1983 and the decision of the local authority to demolish the east and west gables of the church on safety grounds, stated that âworks of an equivalent elaboration and richness to St Eunanâs and Tullamore church will never be built in Ireland againâ. Tullamore church was he noted âone of McNamaraâs richest and most successful designsâ after the style of his senior partner, the Cavan born, William Hague. 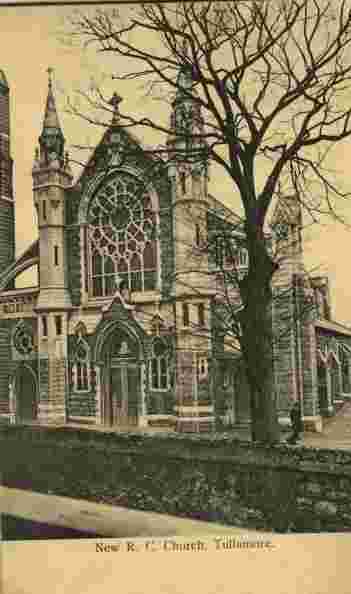 Building work at Tullamore was carried out by James Wynne of Dundalk and the church was in use at Christmas 1905 when nine people were baptised. The last stone of the new church was uplifted to the spire on Holy Thursday 1906 and the cross placed in its position (209 feet up) by one of the curates, Fr Fitzsimons. The new church was designed to accommodate 1,600 persons, with another 500 on special occasions. 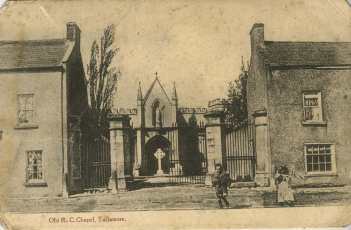 The Most Reverend Doctor Gaughran, the newly elected Bishop of Meath, dedicated the new church on October 7 1906, an autumn day filled with sunshine. In his sermon to the packed congregation, Fr John Brady, PP of Dunboyne said that the community of Tullamore had very much made the building of the church a work of their very own. He noted that there had been no break in the work, no flagging of zeal. âYou have done a great workâ he said, adding âwith stone and marble and stained glass, with brass and silver and with gold you have written in bold characters the story of your faith and your loveâ. Father Philip Callary P.P. assisted in the service of consecration. Benediction of the Most Blessed Sacrament followed the mass. The dedication of the new church was considered the âmost remarkable event that occurred in the parish within living memory. . . At night the town was illuminatedâ¦ there was scarcely a window which did not shine brightly, and indeed the whole scene was a remarkable manifestation of the faith of the Catholics of the county town. The splendid band of St Conlethâs, Philipstown [Daingean Reformatory] was present, by special arrangement and played a charming selection of music. The band of the Tullamore Trade and Labour Association also played through the town, and a large crowd kept walking the lighted streets until a late hourâ. A description of the church in The Irish Builder (20 Oct. 1906) is worth reproducing. A large and important church was dedicated on Sunday week by the Most Revd. Dr. Gaughran, Bishop of Meath, at Tullamore. The church, which has but recently been completed, was designed by the late Mr William Hague, and built under the supervision of Mr. T.F. McNamera, of Dublin. The building, which is Gothic, is about 200 feet from the ground, 172 feet is the length from outside east wall to the west door, the nave 36 feet wide, side aisles 18 feet wide each. The sanctuary has on each side two chapels, behind one of which is the sacristy, and near the other a well-lighted room reserved for the nuns who have easy access to their convent. The chancel arch rests on two columns and smaller pillars of Galway granite. Over the altars the groined roof is of fibrous plaster, while that of the centre is of pitch pine. The windows contain cathedral glass, and perfection appears to have been reached in the ventilation, heating, and lighting, the last being by means of electric installation. At the west end is the organ, an instrument the look of which is in harmony with the whole edifice, and was supplied by Telford, of Dublin. The High Alter is a magnificent proof of the sculptor's art. It is of Sicilian marble with panels of Carara and shafts of Cork and Connemara marble, the artists being Messrs. Malone, also of Dublin. There are already also stained glass windows and the Stations, in oils. The stone materials were taken from the local quarries and, as far as possible, local tradesmen and labourers were employed throughout. . . In 1930 the walls of the sanctuary were decorated in mosaics at a cost of over Â£2,500, by the firm of Oppenheimer of Manchester, who were responsible for other work in the diocese of Meath, including the cathedral at Mullingar. In 1970 the Tullamore church was sandblasted and pointed and the spire repaired. In 1972 the organ, considered to be one of the finest in the midland counties, was completely rebuilt under the supervision of Mr Kenneth Jones and at the instigation of the then parish priest, Monsignor Denis Clarke. In 1977 the sanctuary of the church was reconstructed in accordance with modern day liturgical requirements as well as redecorated and rewired. Improvements were made to the grounds also. All this was to change in the early hours of the 31st of October 1983 when the Church of the Assumption was destroyed by fire. By morning all that remained was a burnt out shell. Edward N Smith and Partners, architects, were selected by the then parish priest, Fr P Fallon, to design the new church. The architectâs brief was to re-build the church in such a way as âretain or regain as much as possible of the character of the old church but in a modern idiomâ. This was next to impossible to achieve. He reused much of the old stonework especially on the Chapel Street side and went for a contemporary interior. What was lost of the Gothic exterior and interior was replaced in the self finished timber ceilings and laminated structural frames of the interior. Full restoration of the exterior was not possible in the 1980s. For many the most attractive feature of the new church was the warm and modern interior with its timber spans. John Flanagan & Sons Limited was appointed builders and work began in October 1984 and was completed for the opening of the present and third church on the Harbour Street site in August 1986. The new church had cost Â£2.6 million with the surplus after all collections and donations placed in a trust fund for the continuing upkeep of the church into the future.